Having the 80th anniversary this year, Musashi Institute of Technology will be renamed as "Tokyo City University" in April when the new semester begins. This issue introduces Dept. of Urban and Civil Engineering, Faculty of Engineering, which covers the field of civil engineering, one of the main pillars of the Institute since its foundation. Special focus will be placed on the efforts of efficiently advancing the essential research by effectively utilizing useful software programs in the course of "Disaster Prevention Engineering" in the Dept, where research is made on improvement of the safety of structures forming urban infrastructure and on disaster mitigation throughout the urban system. "Dr. Yoshikawa's Lab for Structural Safety" of the course verifies historical disaster cases, covering social infrastructure directly linked with public life including bridges, based on the urban environment in our country, which is subject to be exposed at the threat of various types of natural disasters. The Lab operates classes and research on disaster prevention technologies to mitigate damages caused by such disasters. Aiming to use functions of superb software programs actively in these processes, the Lab has so far introduced FORUM8 products including "UC-win/FRAME(3D)," which is a 3-D analysis program for space-framed structures, "UC-win/Section," which is a section calculation program that considers biaxial bending for optional shapes of reinforced concrete and steel framed reinforced concrete, "Pier design" for earthquake-resistant design, reinforcement calculation, and preparing drawings based on the seismic coefficient method and the ultimate lateral strength method during earthquakes, "RC substructure design calculation" for design calculation of substructures and RC structures including Rahmen type piers and abutments, and "Mobile UC-1," which is a mobile tool for civil engineering calculation. While devising approaches to innovative design exercises using these programs, the Lab has developed software packages as well as provided open seminars in cooperation with FORUM8. Other Faculties and Departments have also adopted "UC-win/Road," which is a 3-D real-time VR (virtual reality) software product, and "Multiframe," a 3-D structural analysis software product. We interviewed Dr. Hiromichi Yoshikawa, Professor (Dr. Yoshikawa's Lab for Structural Safety: belonging to the Earthquake Risk Management Laboratory, Advanced Research Laboratories since October, 2008), Visiting Researcher Aoto Hiroki, and Dr. Tetsuhiko Kurihara, Associate Professor (Dr. Kurihara's Lab for Structural Safety), and others. In 1929, Musashi Senior Engineering School was founded with three departments of Electrical Engineering, Civil Engineering, and Architectural Engineering. Then in 1949, it was renamed as Musashi Institute of Technology under the Education Reform Law, with three departments: Architectural Engineering, Mechanical Engineering, and Electrical Engineering. Along with newly establishing the Faculty of Environmental and Information Studies in 1997 and the Faculty of Knowledge Engineering in 2007, departments within the Faculty of Engineering also have been expanded in number and scale. Furthermore, at the 80th Anniversary in April 2009, Faculties of Urban Life Studies and Human Life Sciences are going to be established, which are humanity faculties. 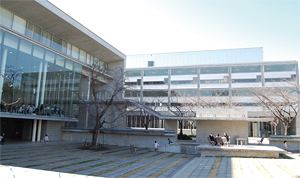 Developing into a university having five faculties with 16 departments, Advanced Research Laboratories, and Atomic Energy Research Laboratory located at four campuses in Setagaya, Yokohama, Todoroki, and Ozenji, the Institute will be reborn as "Tokyo City University" (with Hideo Nakamura as President), as was mentioned at the opening. This change is expected to have the organization prepared for linking cities and people based on the accumulation in the civil engineering field, and capturing the future in an integrated manner. The Faculty of Civil Engineering consists of eight departments of Mechanical Engineering, Mechanical Systems Engineering, Nuclear Safety Engineering, Biomedical Engineering, Electrical and Electronics Engineering, Chemistry and Energy Engineering, Architecture, and Urban and Civil Engineering. Since October 2008, the Faculty has been working as a key member in collaboration with Muroran Institute of Technology on "Cooperation between universities located in remote areas on educational and research activities: with cooperative research on hydrogen energy as an opportunity," which was selected as a strategic project for supporting cooperation of universities (Ministry of Education, Culture, Sports, Science & Technology: MEXT). Presented in this issue, Dept. of Urban and Civil Engineering, Faculty of Engineering, consists of three courses: Urban Design (Urban Policies / Infrastructure Design), Urban Environment (Hydrosphere / Lithosphere), and Urban Disaster Mitigation (Structural Disaster Prevention / Disaster Mitigation). Instructed by Prof. Hiromichi Yoshikawa in undergraduate and graduate schools, Mr. Hiroki Aoto has been specializing in analysis of concrete structures, presently belonging to Dr. Yoshikawa's Lab for Structural Safety (Urban Disaster Mitigation Course). In the Lab, they are making research including "Research on earthquake risk analysis of railroad facilities and risk transfer measures," which is granted with subsidy for scientific research by MEXT, nonlinear analysis of concrete structures, performance evaluation design method, and seismic risk analysis. "It is our strategy to use functions of a good software product to the fullest, setting up research on its extension," said Prof. Hiromichi Yoshikawa. Reflecting this idea, IT (information technology) utilization has been promoted from early on in his Lab. As part of this, UC-win/FRAME(3D), which is positioned as the main tool among others in the Lab, was introduced about five years ago. Indeed, about 10 years ago when Mr. Hiroki Aoto was a student at the Lab, he felt strongly the necessity of numerical simulation for the research in relation with earthquake proofing. After he joined FORUM8, he was involved with developing the product itself. For this reason, he implemented effective functions as much as possible from a researcher's point of view. After he moved to the Institute in autumn in 2007, he shifted his viewpoint to that of students who use the software in the Lab, paying attention to its advantage of enabling them to represent and understand a quake of a 3D structure without necessarily being familiar with calculation theories as before. Actually, students who used it for preparing their graduation theses gave comments that it made it easy for them to understand visually the estimation of the damage degrees of a bridge. UC-win/Section is also useful in the Lab. By using a part of its functions, they automated various complicated calculation that had been done manually until then in the class of reinforced concrete engineering etc. Prof. Yoshikawa says that after it was adopted for the classes two years ago, students became able to devote their time to the research work lying further ahead, with which students should originally address, instead of spending it for such calculation. Mobile UC-1 is something that is used more effectively than expected. Since most students have a mobile phone today, use of Mobile UC-1 with other advanced tools has contributed to improving efficiency, especially in classes taken by a large number of students. "Pier design" and " RC substructure design calculation" have been introduced for the purpose of complementing the work done with UC-win/Section mentioned above and adapting to more detailed calculation. Mr. Hiroki Aoto describes his view that it is a characteristic position of the Lab to make efforts to provide opportunities of using these software products widely with the students in the Dept., while using appropriate products for different classes and research. What's more, the Lab has devised and is practicing original design exercises using commercial software packages in order to have the students learn earthquake-resistant design calculation of RC piers efficiently and in a short term. These exercises are applied in the class of "Design exercises for urban infrastructures," arranged for junior students as an exercise subject regarding RC engineering or design. The course provides a set of two classes a week, 90 minutes for each class, continuing for 14 weeks. 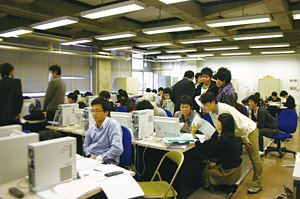 Among them, 10 weeks are allocated to the exercises for earthquake-resistant design of RC piers, assigning three faculty members (Professor Hiromichi Yoshikawa, Associate Professor Tetsuhiko Kurihara, and Mr. Hiroki Aoto) and four students (seniors and the 1st graders of Graduate School) as TAs (Teaching Assistants). Professor Hiromichi Yoshikawa (center), Visiting Researcher Hiroki Aoto (right in the back), Associate Professor Tetsuhiko Kurihara (left in the back), and students of Dr. Yoshikawa's Lab for structural safety. The exercises were arranged to design RC T-shaped single-column piers using earthquake-resistant design according to Specifications for Highway Bridges. In doing this, they utilized "Pier design" (1 license), UC-win/Section (6 licenses), and mobile UC-1 (each student's mobile phone). It was planned intentionally not to provide the tools with all the students (60 people) at the same time. In concrete, three exercises were offered in order, including ex.1: Section analysis of the pier base, ex.2: Earthquake-resistant design of RC piers (existing bridges), and ex.3: Earthquake-resistant design of RC piers (earthquake-proof reinforcement). For each exercise, students were required to submit a report. For example, in calculating for M-φ by using UC-win/Section for ex.1 section design, there were not enough number of software packages; therefore, three teachers and four TAs instructed the first group of students, and those students in turn taught other students. This approach was kept on in a relay form until everyone is covered. It was found that the work of all the students were mostly finished within a set of two 90 min.-classes. They also conduct manual calculation of bending strength of section with single reinforcement, comparing this with the calculation result of the software. In ex.2, they conduct earthquake-resistant design calculation based on the allowable stress design and the ultimate lateral strength method during earthquakes, using the section determined in ex.1. Mobile UC-1 is used for the former, while UC-win/Section is used for the latter respectively. In fact, in ex.2, students were provided with certain conditions so that verification with the ultimate lateral strength method during earthquakes is led to be "OUT." In ex.3, it was required to change reinforcement arrangement so that the verification result would become "OK" and to write a report similar to ex.2 again. "It is important to establish the use first. For that purpose, it is necessary to improve the quality more." 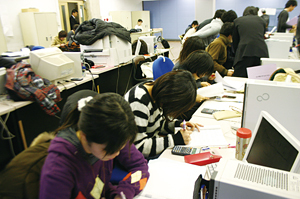 They carried out the design exercises using this software package in two consecutive academic years of 2007 and 2008. As it appears that a certain outcome has been obtained, Prof. Hiromichi Yoshikawa is hoping to continue this attempt from the next year on, establishing it as a research pattern.